If your garden is getting crowded, but you can’t seem to stop buying new succulents and cacti, it’s time to consider your options. You could curb your spending, but that would be silly. Instead, make use of your vertical space with trailing succulents and cacti. These spectacular trailing plants are an interesting addition to any garden. Their long, draping stems are absolutely stunning as wall art, but they look just as good in fairy gardens and living wreaths. These gorgeous, cascading plants add character and whimsy to any room or garden. 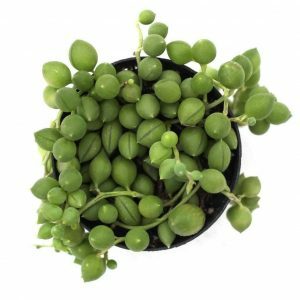 String of Pearls is one of the most popular trailing succulents. The nearly spherical leaves on this plant are about the size of a pea and the trailing stems can reach two to three feet in length. They are a great addition to hanging baskets but also make excellent ground cover. This gorgeous succulent is easy to care for and can easily be propagated with cuttings. They do best in partial sunlight but can handle full sunlight if properly acclimated. They are typically dormant during the summer, doing most of their growing during the winter months. 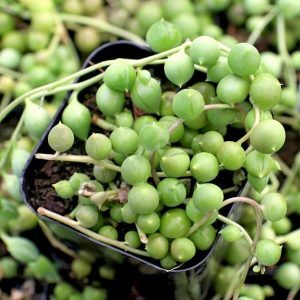 Add this beautiful String of Pearls from Mountain Crest Gardens to your collection of trailing succulents! 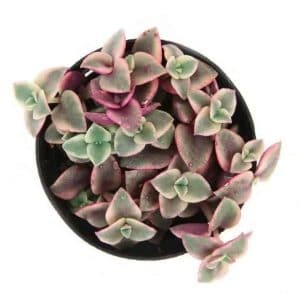 This adorable succulent has long, trailing stems covered in heart-shaped leaves. The leaves come in shades of green, pink, and cream. Their draping stems can reach a length of about 12 inches. In mild climates, they make excellent ground cover, but also do well in indoor containers. Calico Kitten thrives in partial or filtered sun and with well-draining soil. They tend to bloom in the spring and produce petite white flowers. They do not tolerate frost, but they can handle dry conditions. They are also easy to propagate with cuttings. Leaf and Clay offer some of the most beautiful Crassula Marginalis Rubra around! The Peanut Cactus is an interesting looking plant with long, finger-like stems up to six inches in length. The stems are about a half inch in diameter and are covered in soft, bristly white spines. The Peanut Cactus grows in clumps and are ideal for both hanging planters and ground cover. Peanut Cacti do well in shallow containers placed in partial sun. They prefer little to no water during the winter months, but in the Spring they are ready to bloom. The Peanut Cactus produced bright orange or red flowers about two inches in diameter. Mountain Crest Gardens is a great place to find your new Peanut Cactus. As an epiphyte, the String of Nickels thrives in humid environments. They are sensitive to overwatering and must be planted in well-draining soil. They do not tolerate frost and prefer partial sunlight. Wouldn’t this plant be a fabulous addition to your garden? This unique cactus is sometimes referred to as “Monkey’s Tail” because of its long, draping stems and bristly white spines. Its trailing stems can reach an incredible eight feet in length. Beneath the soft, hairy spines, the stems are a greenish yellow in color and measure up to three inches in diameter. These interesting looking plants don’t start out with trailing appendages, instead they grow upright at first, then droop and trail as they mature. Monkey’s Tail Cacti prefer full sunlight and little to no water during the winter months. They require well-draining soil and must be watered in the spring and summer only when the soil is dry. The long stems can cause this plant to be somewhat difficult to repot, so be sure to handle it carefully. 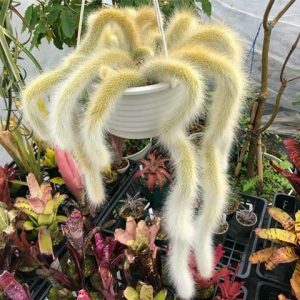 The Monkey’s Tail Cactus is definitely a conversation starter! This one can be bought on Etsy. 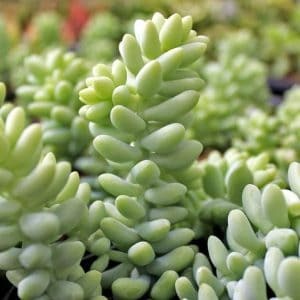 The Burro’s Tail is one of the most popular trailing succulents, and with good reason. It’s easy to care for and easy to propagate. Its long, trailing stems can reach up to three feet in length. The stems are covered in thick, fleshy leaves that are bright green in color. 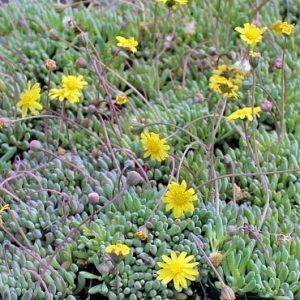 This lovely succulent does best in partial sun and when protected from frost. The leaves can be somewhat delicate and may fall off easily, but they can be propagated with ease. The Burro’s Tail blooms in spring and produces beautiful pink flowers at the tips of its stems. Mountain Crest Gardens has a wonderful selection of Burro’s Tail plants. This fascinating little succulent gets its common name from the pickle-like shaped leaves that cover its stems. The brightly-colored, trailing stems grow quickly and can reach up to about eight inches in length. 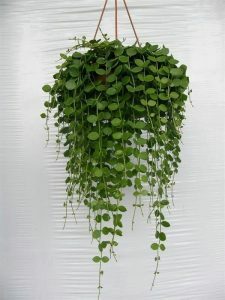 They do well in hanging containers, but their densely growing stems make excellent ground cover as well. Little Pickles prefer partial sunlight and well-draining soil. They can bloom year-round and produce bright yellow flowers that stand high above the leaves on bright red or purple stems. Little Pickles thrive in shallow containers with enough space for them to spread. Don’t you want to add some Little Pickles to your succulent collection? Grab ’em on Etsy. The Rat Tail Cactus has long, trailing stems that can reach up to five feet in length and nearly an inch in diameter. They’re covered in fine, white spines, giving the plant and almost fuzzy appearance. Rat Tail Cacti grow quickly, as far as cacti are concerned, and are easy to care for. Rat Tail Cacti enjoy partial sun and well-draining soil. They do not tolerate frost but are drought tolerant. This unique looking plant blooms in the Spring, producing bright pink flowers. 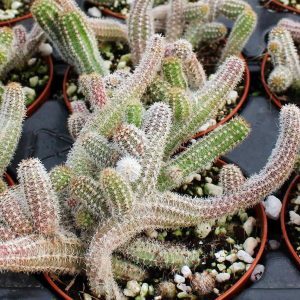 The Rat Tail Cactus is easy to propagate with cuttings, but can also be grown successfully from seeds. 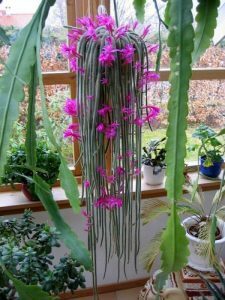 The cascading stems and beautiful pink flowers make the Rat Tail Cactus a wonderful choice for any garden. The String of Beads, sometimes called the String of Raindrops, is similar to the String of Pearls except the leaves have a more elongated, raindrop shape. The leaves are bright green in color and are about half an inch in diameter. The trailing stems can reach two to three feet in length. String of Beads are easy to care for and require partial sun and porous soil. They flower in the Spring, producing small, white, brush-like flowers. They do not tolerate frost, but are extremely drought tolerant. 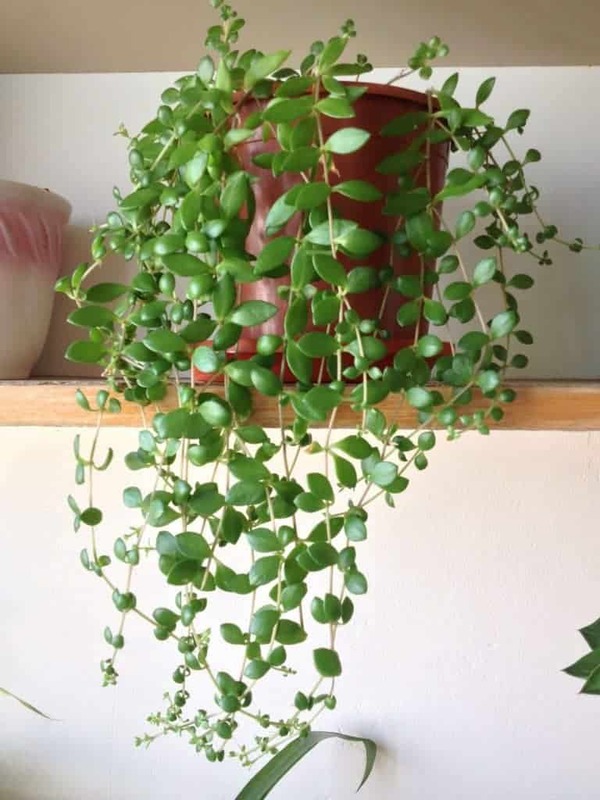 String of Beads are easy to propagate as well as grow from seed. Find this adorable succulent at Leaf and Clay! With these trailing succulents and cacti, there’s no need to limit your succulent garden to what you can fit on the ground. Now, you can confidently add more beautiful plants to your collection without having to worry about running out of room.